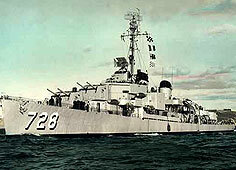 A destroyer named in honor of Sergeant Duncan Mansfield, a United States Marine, the USS Mansfield DD-728 was part of America's wartime naval build-up during World War II. She was launched 29 January 1944 at the Bath Iron Works Corp., Bath, Maine, and commissioned 14 April 1944, with Cmdr. Robert E. Brady Jr., in command. The 27-year Navy veteran made a final coastal cruise as a Navy warship from Long Beach to San Diego, where she was decommissioned, 4 February 1971. During her years of active duty, she received five battle stars for World War II service, three for Korea and three for Vietnam.